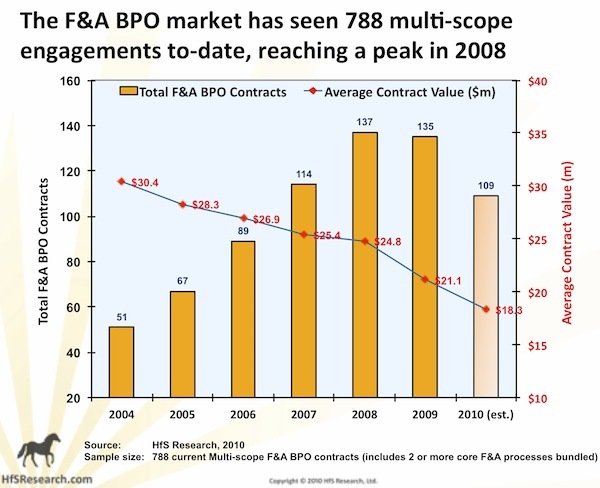 We’ve been wallowing in white papers, plied with PowerPoint and overwhelmed with oratory, but despite all the chest-pumping, the very latest market picture of F&A BPO sends us one very clear message: the market remains dominated by a small handful of established service providers, while the market entrants of recent years have struggled to make a major impact. Not a lot has changed in recent years, as over half the market expenditure for all live engagements sits in the hands of three providers, and several of the multi-billion dollar IT services market entrants are clearly struggling to take any significant share away from the “Big 4” incumbent providers; Accenture, IBM,Genpact and Capgemini. HP and Xerox (ACS) have lost some ground, especially in light of their recent mergers, while the smaller pure-plays WNS and EXL are impressively holding their own against the likes of multi-billion dollar offshore giants Wipro, Infosys, TCS and Cognizant. But won’t this situation change, as deals continue to get smaller? 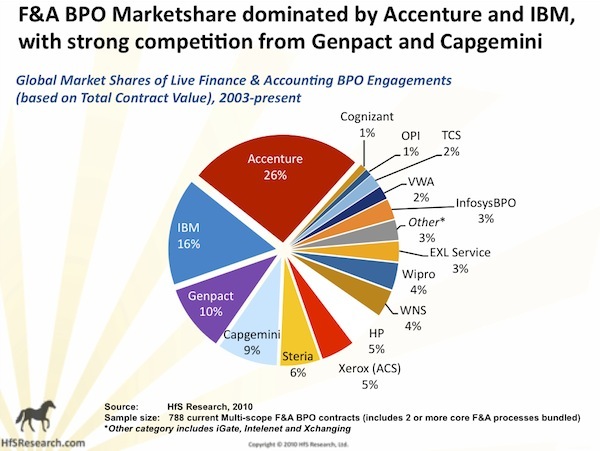 The prime reason why the “Big 4” F&A BPO providers dominate marketshare, is their ability to pick up multiple deals in the $50m+ range over recent years, increase the scope and renew them – with Accenture proving the most adept at wooing large enterprise clients and cultivating their portfolio. The newcomers, over recent years, have struggled to win many (or, in some cases, any) mega-deals, and have aggressively sought to grow their respective footprints by taking on much smaller-sized engagements – many of which fall into the sub-$5m TCV category. However, the following data shows the deals steadily decreasing in size, with this year’s average falling below $20m for the first time, so isn’t this shifting the advantage to the newer market entrants, more eager to take on small, less profitable engagements and grow them? The IT services offshore goliaths, which have recently entered this market, are quickly learning that BPO isn’t IT, and you can’t scale from 10-to-200 employees within each of your clients within a couple of years. Most will be lucky if they can scale from 10-to-30 FTEs over the course of a five-year engagement. Scaling a global BPO business based on multiple small client engagements is waring on resources – and profit margins, and the providers scrapping for their share of the smaller business, are faced with a simple choice: Either stick with it and view this as a 10-year journey, or if you simply don’t have the patience or appetite to put in the investment, then get out and refocus your services on other activities. For those who stay the course (and we expect most will), they need to keep putting in the grind to win small engagements, and attempt to scale their BPO delivery resources, while trying to turn some sort of profit. An acquisition or two along the way wouldn’t hurt, either. However, for the established providers, the simple fact they have much larger delivery resources working on bigger, and – in many cases – significantly more profitable engagements, puts them in a stronger position to compete for the small stuff. They can literally plug in new clients, reallocate personnel, and balance resources – often without having to invest in a lot of additional personnel to service the client. Moreover, having a broad F&A staff-base also helps providers expand into related BPO areas where staff can be trained to work on different processes, for example insurance claims processing, order management, merchandising support, and so on. Common technology platforms, common process workflows and Cloud provisioning, are all tools to increase the multi-client shared-service capability for providers, but you can’t escape the simple fact you need flexible, ample, people-delivery resources to win the business in the first place.